My daughters have all grown into quite loyal dystopian fans--and I think this genre pops onto my reading list more than any other as I often read the books that they read. When I was offered the opportunity to read the Watcher series; I immediately added both books to my reading list. 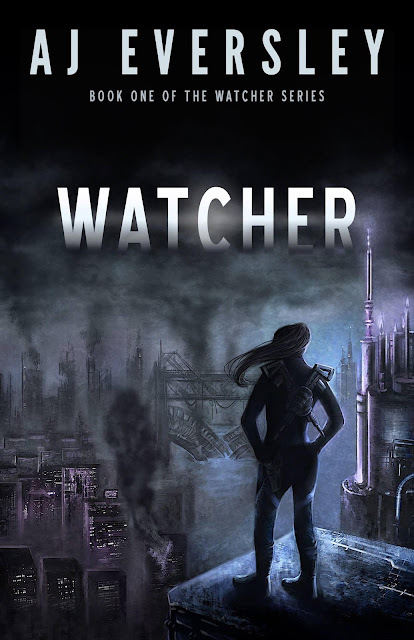 I am excited to share a review of the first book of the series, also titled Watcher, this morning--and offer readers the opportunity to enter to win a prize in the book tour giveaway at the end of this post! I am currently reading the second book in the series, Carbon, and will share a review of that novel next week! Watcher was Impossible to Put Down. I typically read while waiting for the girls after school or between activities. After not finding time to begin this book after several days; I opened it one evening before bedtime planning just to start it and "get a feel" for the author's writing style. A few hours later, I was reading the last pages and putting the second book in my bag to read! The book maintains an action packed pace--and incorporates enough twists and turns (some rather sudden and unexpected) that readers will find it impossible to put down. Thank you for reviewing Watcher and I am glad you enjoyed it! !